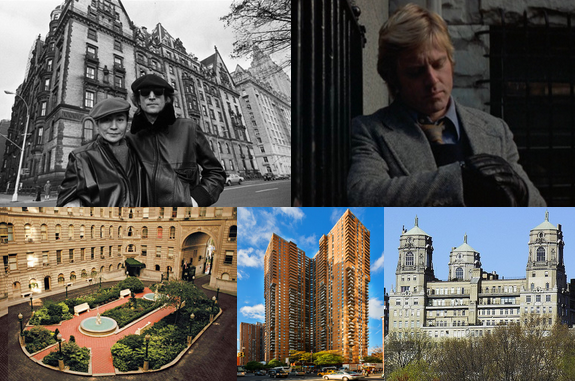 If you have ever wondered where the uber rich and famous live, here is a short list of iconic New York City apartment buildings, featuring unparalleled amenities and a storied past. In a city with an abundance of historic buildings, these landmarks stand out for their well-known residents, familiarity as film locations and famous – and in some cases infamous – history. 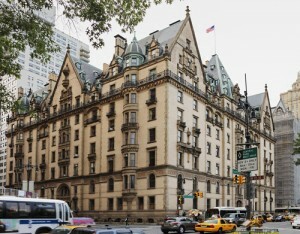 Despite the fact that The Dakota remains one of New York’s most prestigious addresses with famous residents including the likes of Lauren Bacall, Leonard Bernstein, Connie Chung and mobster Arnold “The Brain” Rothstein, the first thing comes to mind about The Dakota is that it was the scene of Beatle John Lennon’s murder. The apartment building is just across from Central Park’s Strawberry Fields, where a memorial pays tribute to the singer/songwriter and peace activist. The Dakota was commissioned in the 1880’s by Edward Clark of Singer Sewing Machine fame. High gables, deep roofs, dormers, balustrades and balconies made it a natural setting for films including Rosemary’s Baby, The First Wives Club and Vanilla Sky. Revaluate scored The Dakota an 83, with an superb environment. If you were searching for an elegant residential hotel in the early 1900’s outfitted with Turkish baths, a lobby fountain with seals and a working farm on the roof, The Ansonia was the place to be. The Ansonia was built by eccentric copper heir William Stokes, who envisioned the grandest hotel in Manhattan with utopian self-sufficiency. The Ansonia was the site of blackmail plots, a major league baseball scandal and the arrest of bank robber Willie Sutton. Bette Midler and Barry Manilow got their start at the onsite gay bathhouse, and later notorious Plato’s Retreat opened at the site. 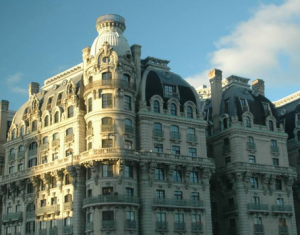 Movies including Three Days of the Condor and Single White Female were filmed here, and Angelina Jolie, Flo Ziegfeld, Babe Ruth, Toscanini and diva Lily Pons have called The Ansonia home. 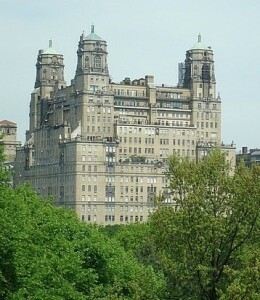 Revaluate scored The Ansonia a modest 71, with very high expenses. Listed on the National Register of Historic Places, The Apthorp is one of very few Manhattan structures to occupy an entire city block. 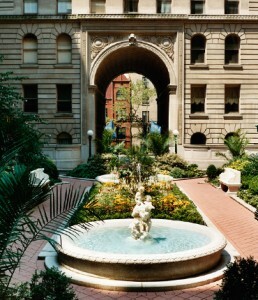 Built for William Waldorf Astor in 1906, The Apthorp features Old World craftsmanship with elaborate wrought iron gates, oversized sculptures, a circular cobblestone driveway and four buildings arranged around a courtyard with evergreens and magnolia trees. This very pricey New York City landmark has included tenants Al Pacino, Lena Horne, Joseph Heller, Rosie O’Donnell, Conan O’Brian, Nora Ephron and Cyndi Lauper. A high drama condo conversion in 2008 captured the attention of New Yorkers and brought about a reconfiguration of some units, a challenging prospect since each apartment in The Apthorp is unique. Revaluate scored The Apthorp Condominium a low 66, with questionable safety and a filthy environment. Elegant Co-op apartments in The Beresford are among the priciest in the city, with some listed up to a staggering $62 million for original pre-war detailing like fireplaces, herringbone flooring, intricately paneled walls along with terraces featuring glorious views of Central Park. The Beresford, named for the hotel that occupied the site since 1889, has attracted an A-list of residents including Meryl Streep, Glenn Close, Diana Ross, Rock Hudson, Tony Randall, Isaac Stern, Calvin Klein, Beverly Sills, John McEnroe and Diane Sawyer. Another Beresford resident, Jerry Seinfeld, inspired the “Seinfeld Rule” that fines co-op shareholders for renovations that pass completion dates. Revaluate scored The Beresford a positive 84, with great quality of life. Manhattan Plaza is so unique that a documentary is in production, Miracle on 42nd Street. It was conceived as a luxury building to revitalize the Times Square area, but failed to attract high end residents. The proximity of the theater district led to the concept of affordable housing for the performing arts community. Residents have included Larry David, Al Pacino, Broadway’s first Annie and her dog, Alicia Keys and James Earl Jones. Louis Black staged more than 40 shows at the West Bank Café on the lower level, where Bruce Willis tended bar. Of special note is the 3,500 square foot rooftop health club with a retractable atrium roof, a rock climbing wall and an outdoor sundeck. 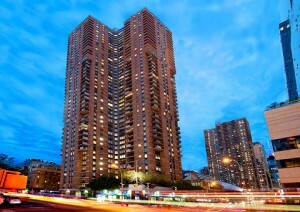 Revaluate scored Manhattan Plaza positively with an 81, and low expenses. Learn the rich history of your building and its famous inhabitants for free at Revaluate.com. Revaluate hosts the No Fee NYC Rental Map and displays a Carfax-like home history report with history, ratings and reviews for every Manhattan address. Are These 6 New York Pied-a-Terres Nefarious? Great list Revaluate team……but its seriously SO HARD to come up with a top five in New York City. A city like this needs a top 200 list (or maybe a top 500 list). Buildings like The Eldorado at 300 Central Park West , The Dorilton at W71 and Broadway or the iconic Plaza Hotel on 5th Ave have incredible history (both residents past and present with rich architecture). Very true… 15 CPW, The Plaza Condominium. There’s no shortage of famous buildings in NYC.